Martin Boyce is known for his large installation work in sculpture, creating angular replications of the world around him, finding meaning in everyday surroundings and working steel structures into amplifications of these moments in space and time. 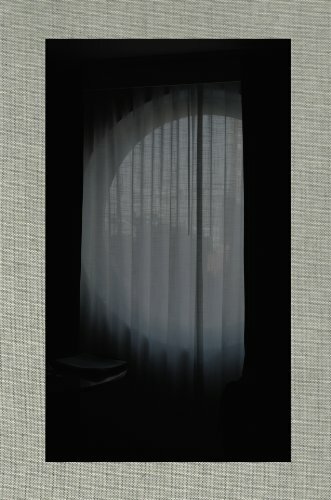 A Partial Eclipse brings together photographs from an on-going private library of images which feeds into Boyce’s work. The images adopt a sombre and darkened palette, as if the light has been stolen from each photograph creating the illusion of a mythical perma-dusk allowing us to see the world as Boyce sees it. Images of trees and foliage permeate the collection, ellipses and perforations reoccur, patterns of cracks, fractures and spider webs repeat and thresholds appear in the form of windows and doorways. Hundreds of photographs were edited down until the shape of a book emerged. The series creates the feeling of stillness and distance between the viewer and photograph. Printed on double sided paper, the photographs reflect blurrily in the coated page opposite it’s matte brother. The book as an object extends the experience of distance through its design, keeping the darkened images enclosed and projected between the folds of paper.